The government of Terra would like to remind all citizens that it is now officially tax season. All citizens of Terra (excluding members of Parliament) are required to pay L$5 in taxes per electoral period. 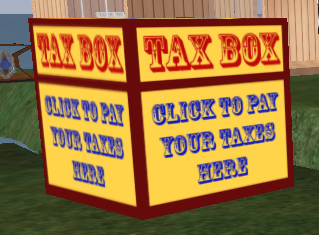 Please log in to Second Life and pay your taxes now. To pay, simply click on the “Tax Box” in the middle of Terra and choose the L$5 option in the dialogue box that pops up. You should then receive a message thanking you for paying your taxes. This is also a reminder that alny citizens of Terra who fail to pay their taxes may face imprisonment and/or public humiliation. Thank you very much.